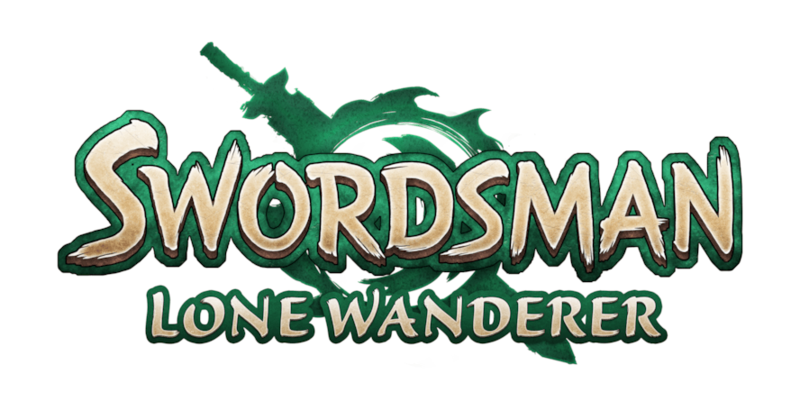 One title that brought quite a bit more entertainment than expected this year was Perfect World Entertainment’ Swordsman Online. While we’ve been following the game officially since its Chinese closed beta test last year, and unofficially since I first encountered the game at E3 2010 before I even worked as gaming press, the actual gameplay of the current polished version is beyond what I had expected. With almost no preparation, I was thrown into the role of a rather advanced Shaolin monk alongside our new site engineer Zelus as a female member of the Five Venom school. Although I’d like to discuss the two other schools involved in our press demo, the guys across the table spent most of the fight walking into random corners without contributing much. I don’t entirely blame them though as I’ll get into the control scheme. 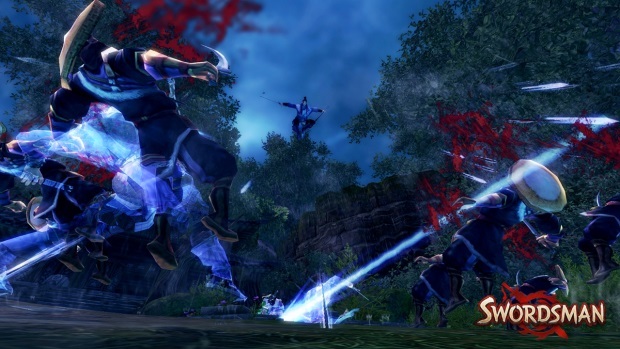 Swordsman Online offers three different control schemes in an attempt to cater to a larger audience. Traditional 3D is best described as a traditional point and click MMORPG system and was my default setting when jumping into the game. 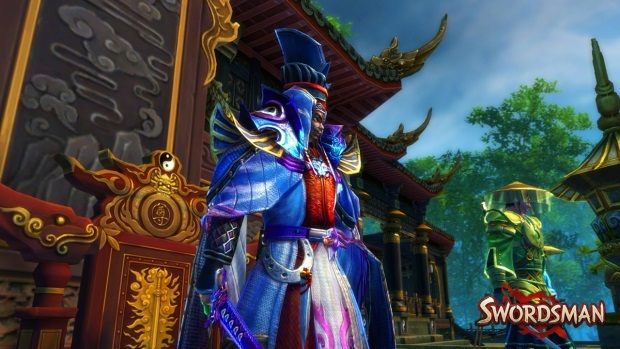 As a massive fan of games like TERA, WildStar, and Dragon Nest, I will straight out say it felt like a cheapening of the Swordsman experience. The lack of an auto-move when activating skills while out of range just felt clunky and unresponsive. 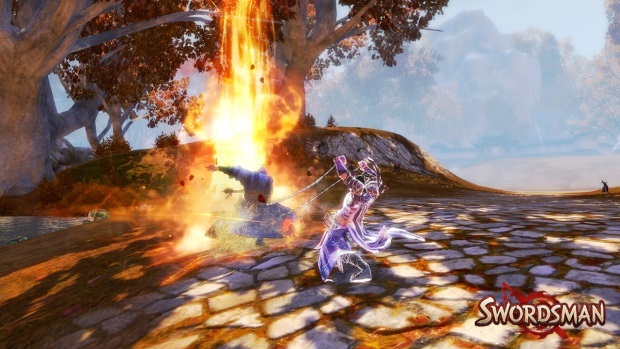 The Action control scheme is closer to a Guild Wars 2 system and essentially puts a higher level of challenge into the game in exchange for the feeling of having greater control of your character’s movements. The Classic control setting was my personal favorite, feeling a lot like the action control scheme at first but offering subtle support mechanisms to help with landing the more complicated skills likely not initially built with an action control scheme in mind. Beyond the controls, I was further impressed by Perfect World Entertainment’ decision to follow their community’s advice and leave the original Mandarin voice acted cut scenes in for the western release. With the alternatives being either silence or poorly acted and horribly lip synched English, this was clearly the superior decision. 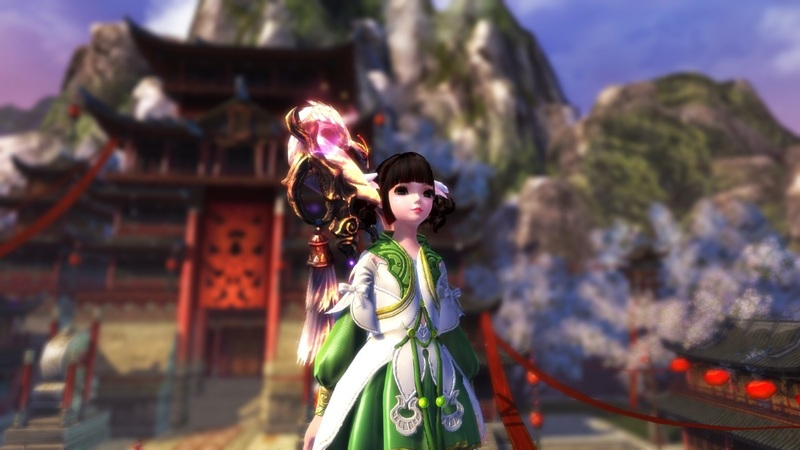 Especially for a game so focused on telling an epic Wuxia tale. You can feel the emotion emanating from the main characters, and I can’t wait to play it from the beginning to gain a better understanding of the context of the battles I witnessed. For those looking for grand freedom in character customization, I can say with certainty that the Swordsman character customization felt like a modern rendition of the original Perfect World International character creator. The fact that our PR rep was recreated as a comical and strikingly Irish wuxia warrior said volumes about the freedom allocated in the system. Fears of a million cloned Asian warriors running dungeons together in this game can be set aside. The actual demo we were presented with involved the revenge arc of the story to strike down the organization that killed the protagonist’s mentor over a legendary sword. As if the combat itself didn’t play out beautifully enough like a live-action Wuxia film, the transitional scenes between each zone change locked in the feeling. I felt the hair standing on the back of my neck when the evil master welcomed our team of four into a courtyard filled from wall to wall with disciples. 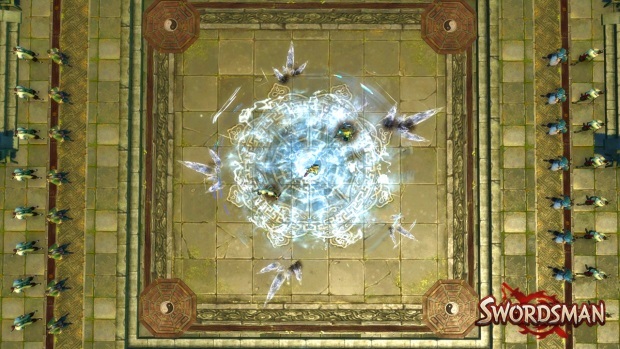 The resulting battle is amazing as mini-boss disciples jump into a death square to challenge you one by one as a constant barrage of disciples toss bombs and attempt other surprise cheap shots from all sides to keep your guessing. Each mini-boss is voice acted, and cocky enough to make laying the smack down on him all the more enjoyable. The challenge is also there, and even on our buffed characters we all were forced to utilize our potions to stay in the battle as few mistakes are tolerated. 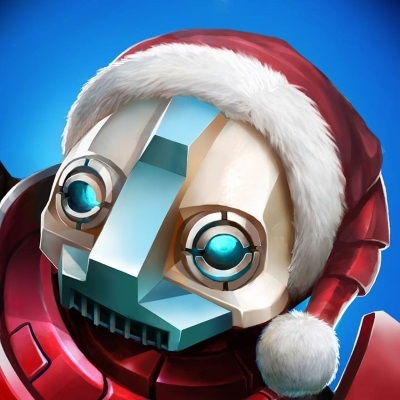 There seemed to be a great balance between skill cost, cooldown, challenge of use, and power. We were advanced enough in level to utilize stance swaps as well to completely change up our skill bar depending on the situation. For instance my monk could utilize whirlwind tornadoes from a safe distance when the numbers were too overwhelming, or switch to a melee tanking stance in order to gain buffs to my melee strikes and defenses. I was fond of the majority of strikes involving a combo of left clicks followed by a slow aimed power attack via the right click. This simplistic combat kept things nice and fast. 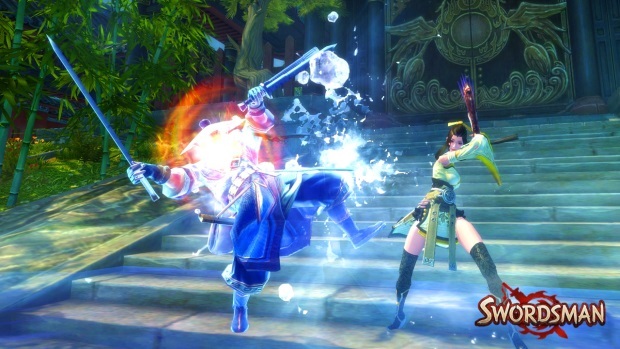 For gamers in love with sparkly ultimate skills, Swordsman won’t disappoint either. Although incredibly challenging to unlock, involving picking up 10 or so rare power orbs dropped from enemies, the effort and patience is worth it when unleashed. We had the pleasure of seeing Zelus turn into a poisonous ballerina of doom as his girl painted the ground purple with poison in a show of extreme whip mastery that left a large section of the square battleground void of life. After the demo was over, I challenged Zelus to a duel to gain a greater understanding of the controls. Good thing too as the jump/dash system in Swordsman is extremely satisfying! You can literally triple jump and then run in circles in the air while launching ranged attacks at your foe. Rather than having a set number of dodges alongside your UI akin to other action titles like Wildstar and upcoming SkyForge, you have a stamina bar that forms a semi-circle alongside your avatar. Every jump, dodge, and air dash reduces a portion of the bar, and if you hit the bottom, your character’s running speed becomes sluggish. You also will be completely unable to jump, punishing you pretty badly in the dash heavy PvP it turns out. 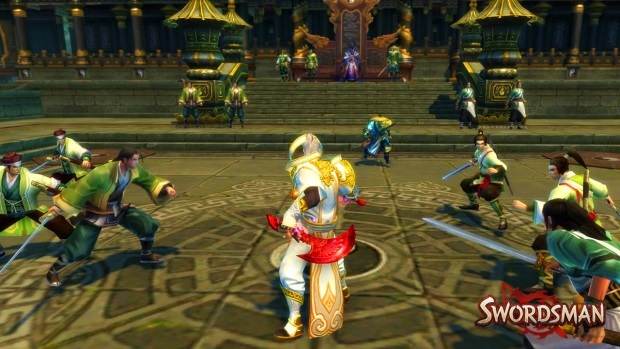 Those looking for the more traditional MMORPG experience though will be glad to hear that Swordsman Online still packs the traditional vertical progression system. Despite the numerous combos I pummeled Zelus with, his health bar barely moved thanks to his far superior gear. Granted this can be a huge negative to energy junkies wanting to put their twitch skills to the test, so certainly keep it in mind when checking out this game.